Sue is a longtime fan of the A Song of Ice and Fire series who has learned to be at peace with the changes made for the show. Except when she isn’t. 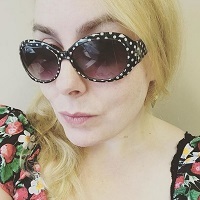 Known as Ours Is The Fury when she contributed her investigative skills and occasional editorials to WinterIsComing.net, Sue’s a fiend for filming news, casting season and Jaqen H’ghar, and has a soft spot for the Greyjoys despite the House Baratheon nickname. Sue can be found somewhere in the American midwest, scribbling in notebooks and chasing after her offspring.